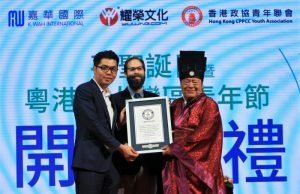 Hong Kong (Hong Kong SAR) – September 25, 2018 (travelindex.com) – A new Guinness world record of group calligraphy was set at the inaugural “Guangdong-Hong Kong-Macau Greater Bay Area Youth Festival – Confucius’ Birthday Celebration” at AsiaWorld-Expo. Co-organized by the GuangDong-Hong Kong-Macau Greater Bay Area Youth Association and Confucian Academy, the feat namely “The Largest Calligraphy Class” involved the efforts of 2,252 youths across from the Greater Bay Area, all dressed in ethnic costumes of our country’s 56 ethnic groups, and concertedly completed the calligraphy of Chinese word “ru” (meaning “scholar” or “learned man” in Confucianism) in Lishu style. Among the participants is Alex Fong, a Hong Kong artist who dressed in a Bai ethnic costume to reflect his roots. The event is also dedicated to celebrate Confucius’ birthday. The opening ceremony of the inaugural Guangdong-Hong Kong-Macau Greater Bay Area Youth Festival was also held during the event. Among the officiating guests were Mr. Yasuo Fukuda, Former Prime Minister of Japan; Mr. Lau Kong-wah, Secretary for Home Affairs of the HKSAR Government; Dr Law Chi-kwong, Secretary for Labour and Welfare; Mr. Shen Chong, Director General of the Coordination Department of the Liaison Office of the Central People’s Government in Hong Kong; Mr. Yang Cheng Wei, Deputy Director-General of the Youth Affairs Department of the Liaison Office of the Central People’s Government in Hong Kong; Dr. Tong Yun Kai, President of The Confucian Academy; and Mr. Angus Ng, Executive Chairman of GuangDong-Hong Kong-Macau Greater Bay Area Youth Association. Stringent criteria apply to verify the eligibility of “The Largest Calligraphy Class”. Precision, concentration, commitment and mutual cooperation are just some keys to accomplish the record-setting feat. Prior the event, participants are required to attend a two-lesson intensive calligraphy training instructed by calligraphy teachers to hone their skills. During the event, 2,252 participants are equally divided into 50 groups, or 50 participants per group. Witnessed by notaries, participants must demonstrate full commitment to the class, and write the Chinese word “ru” in Lishi style and with correct strokes. Participants who fail to meet the strict standards will be disqualified by the notaries. Meanwhile, the feat achieves the event’s goals by preaching the concepts mutual cooperation, building a peaceful and harmonious society, enhancing the global understanding of Chinese culture and Confucianism, and inviting global audience to experience the building of China’s modern culture and inheritance of Chinese cultural heritage. Riding on the occasion, a large-scale Confucius birthday celebration is also presented by The Confucian Academy. Comprised of customs and rituals, musical and dancing performances, the 3-hour celebration not only calls upon the solemn yet sophisticated Confucian rituals aligning with the essence of Five Cardinal Virtues, but also opens the door of Confucian culture to youths. The anticipated celebration even impressed fellow officiating guest Mr. Fukuda, a renowned Chinese culture enthusiast who just announced the establishment of Practicing Peace Foundation during his Hong Kong visit to promoting global peace and cooperation. GuangDong-Hong Kong-Macau Greater Bay Area Youth Association firmly adheres to the “One Country” principle and makes good use of “Two Systems”, upholding solidarity of youths from all walks of life across the Guangdong-Hong Kong-Macau Greater Bay Area to cooperate in building the future of Greater Bay Area. A feast of youth activities in Hong Kong, the inaugural Guangdong-Hong Kong-Macau Greater Bay Area Youth Festival is a one-year programme comprised of culture and art exchange, career and entrepreneurship counselling and sharing, and sports events, with the aims of best promoting Chinese traditional culture and facilitating exchanges between youths across the Greater Bay Area. Besides “The Largest Calligraphy Class”, the Festival monumentally commenced with the launch of Innovating Hong Kong – International Talent Carnival, a mega career expo drawing tens of thousands of visitors. The Guangdong-Hong Kong-Macau Greater Bay Area Youth Association is a non-profit organization registered in Hong Kong. GuangDong-Hong Kong-Macau Greater Bay Area Youth Association firmly adheres to the “One Country, Two Systems” principle, upholding solidarity of youths from all walks of life across the Guangdong-Hong Kong-Macau Greater Bay Area, promoting mutual trust, complementarity and win-win reciprocity, and fostering proactive youth participation in building the Greater Bay Area. We welcome outstanding youths in the fields of innovation and technology, finance, shipping, trading, legal, real estate and tourism to join our cross-region, cross-sector exchange mechanism, offering recommendations and decisive references in building the Greater Bay Area. Primarily focused on building the Greater Bay Area, GuangDong-Hong Kong-Macau Greater Bay Area Youth Association offers the latest policy analyses, innovation and entrepreneurship counselling, socio-economic profile of the Greater Bay Area and field visit opportunities. GuangDong-Hong Kong-Macau Greater Bay Area Youth Association has formed a link mechanism in its organizational structure backed by a roundtable of conveners who are outstanding and prominent youth leaders in Hong Kong and Macao Special Administrative Regions, Guangzhou, Shenzhen, Zhuhai, Foshan, Zhongshan, Dongguan, Zhaoqing, Huizhou and Jiangmen, fully mobilizing youth talents across the region to building the Greater Bay Area.